Who knew there were so many classic and forgotten books by Australian women available online? I’ve used a variety of sources to find the texts including the (amazing!) 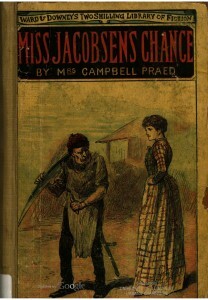 Colonial Australian Popular Fiction: A Digital Archive, a list compiled for an exhibition on Australian Women’s Writing at Monash (pdf here), a list of 19th-century Australian books compiled by Katherine Bode of the ANU (excel spreadsheet here), the AustLit database, TROVE, Project Gutenberg and Gutenberg Australia, the University of Sydney Australian Digital Collections, HathiTrust and Archive.org. You can either scroll through to the entire list of books here, or by decade. Be warned: there are so many more than I expected. With such a choice of books, it’s going to be a challenge to decide what to read. I’m particularly keen to see whether books identified as “popular fiction” stand the test of time, but there are plenty of literary books as well. “Romance” appears to be more numerous than other genres such as “crime”, but whether these are “romances”, as we’ve come to understand the term, or simply entertaining fiction, remains to be seen. Already some members of the AWW Facebook group have expressed an interest in one of the books I’ve found, Miss Jacobsen’s chance: a story of Australian life by Rosa Praed, published in 1886. Isn’t the cover wonderful? Looking forward to hearing what you decide to read. About me: I’m an unapologetic fan of popular fiction, having exhausted my literary tastes with a degree that involved reading English Literature from the Anglo-saxon times to the present day. I’m slowly getting back a taste for more demanding books, but I still love a good page-turner. Through my involvement with the Australian women writers challenge, I’ve discovered a new love for historical fiction. Regarding my own writing, I’ve had two novels published, one a rural romance, Snowy River Man, and the other a romantic suspense, By Her Side, both under the name, Lizzy Chandler. Once I’ve finished helping my 93-year-old aunt write her memoirs, I’m hoping to write a story loosely based on my family history. I’m behind the @auswomenwriters account on Twitter and also administer the AWW Facebook page. Great post Elizabeth and lovely to see more attention being paid to our “old” Australian writers. One question, when you mention Project Gutenberg did you mean the original one, or Project Gutenberg Australia. I just thought I’d provide the link to the latter because it has a special section for Australiana: http://gutenberg.net.au (It also has non Australian public domain texts as well. Thanks, Sue, and thanks for the link. To tell you the truth, I didn’t take note, but I think they may have been to the old (which would have been the first to come up in the search engine, I’m guessing). It will be great to fill in the gaps or find more accessible texts. I find those online versions quite hard to read! You’ve done such a great job in compiling this post. Hopefully the Classics will get a bit of the limelight now. Thanks, Theresa. Just the beginning, I hope! Thanks for the wonderful post Elizabeth. I was pleased to read the document listing several books I want to read including Among the Reeds. But I’ve had no luck yet with Georgia Rivers apart from the option of spending a $100 plus to read the book in photocopied form. Will keep searching though and let you know when I have the blog ready about the ones I have been able to find. Thanks, Debbie. Glad you found something that tempts you. Good luck getting hold of the Georgia Rivers books. They’re still in copyright for ages yet. Have you inquired about their availability via inter-library loan, or are they simply too rare?